The beavers have been very industrious lately and built a second pond below this one. They backed the water up to this first dam and extended the height. It’s now probably about four feet, including what’s below the water in the foreground. Nick made friends with a Canadian Goose that came to greet us, and put him into his painting. 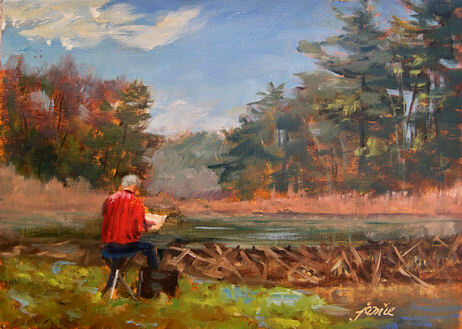 I was more interested in the splash of red color offered by Nick’s shirt, so I painted Nick painting the pond. 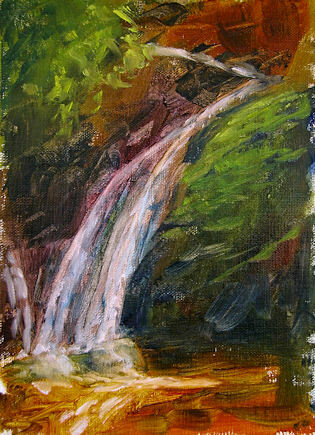 I had five artist friends over to paint a few days ago and everybody chose to paint waterfalls! Sometimes it’s hard for me to paint when I’m the hostess, but I did manage to get this little one nearly finished, and just tweaked it a bit in the studio. Today it rained really hard all day. I just walked my dog past this waterfall and it’s now extended all the way across those ledges. I just might have to go paint it again! Yesterday I was sketching in Hudson, New York with a couple of artist friends. What a great place to draw and paint! If you’d like to see those sketches, just click here. The image above is probably showing this painting at larger than real life on your screen! This is postage stamp size. 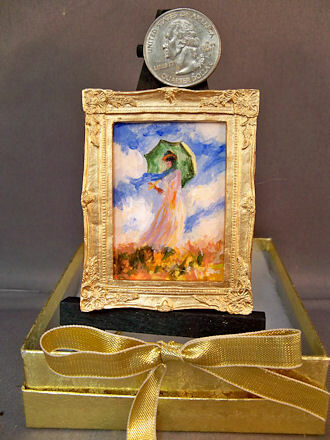 The painting itself is about 1.25×1.75″. The quarter is there for size reference. 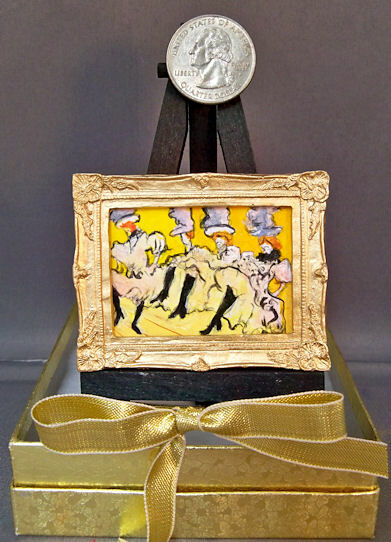 I love Tolouse-Lautrec, and it so much fun to do these Micro Master miniature versions! I had to do some editing and use my own artistic license for this teeny tiny size. For instance, I’d never have been able to do the lettering that was on the painting in this itty bitty format! These tiny master renditions are generally done only on a commission basis, so if you’ve got one in mind that you’d like to order, just drop me an email at JamieWG@aol.com. 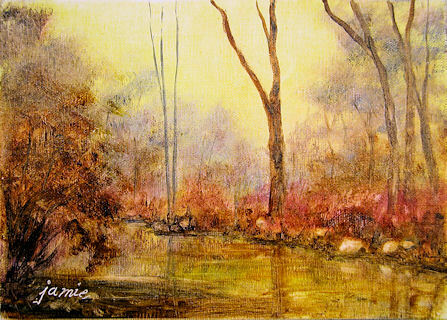 This is what I painted during David’s last quick demo yesterday. 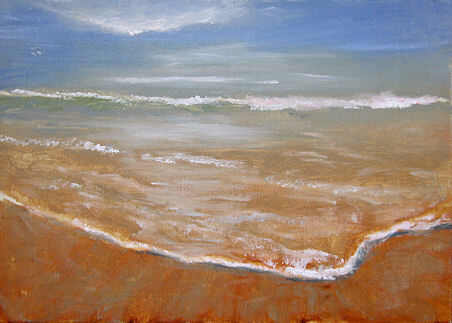 I tried to follow what he achieved in capturing the transparency of the water with wave forms and distance. 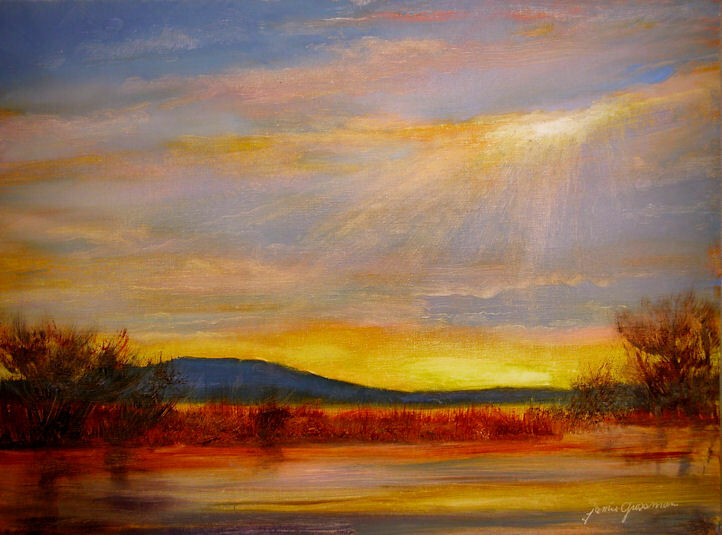 You can stand in this spot, turn in any direction, and see a scene worthy of a painting! 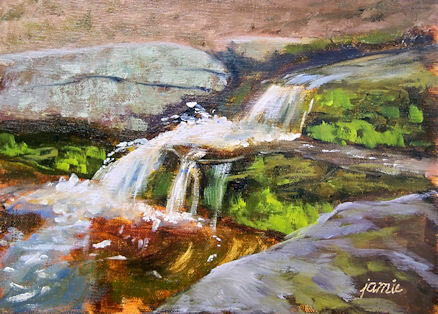 This is in the Platte Clove area of the Catskills, known for its steep and dangerous cliffs and dramatic waterfalls. For some reason, the foreground rocks photographed much higher in blue and purple chroma than they are in the actual painting. I wasn’t able to dull that down without killing the luminosity in the sky. Transparent Red Oxide (which I probably could have done without). There is no white paint. The feeling of luminosity was achieved by the light bouncing through the transparent pigments to the white-primed linen. 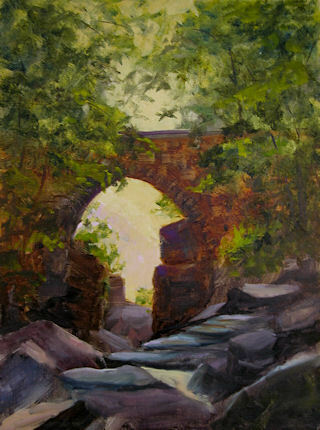 The highlights in the rocks and lights within the foliage masses were achieved by pulling out paint with brushes or bits of paper towel. Paint was added and subtracted like this until I got the effects I wanted. I’ve been working mostly with opaque paints for a very long time, and now I’m very excited about exploring the world of transparents! I was ready to break out my opaque pigments on this if needed, but I think I would have lost more than I’d have gained by adding opaque paint in this particular instance. 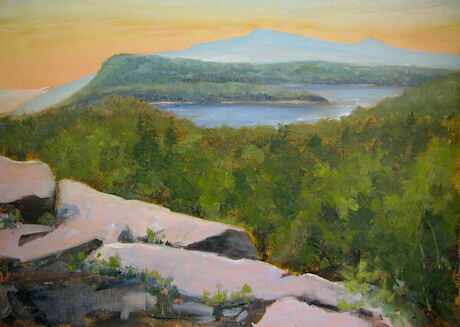 Thomas Cole, Jasper Cropsey, and many other Hudson River School artists painted this view from Sunset Rock. It is truly one of the most spectacular places in the Catskills, and well worth the hike to get there! 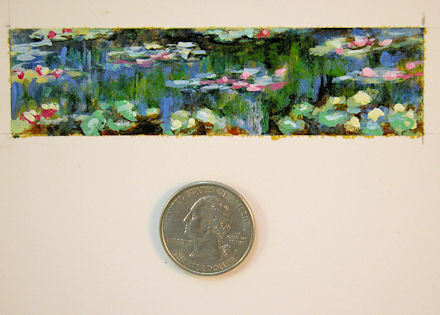 The quarter in the image above is to show you how tiny this painting is! I think this is the most challenging miniature I’ve done to date, though it was also really fun to work on this!